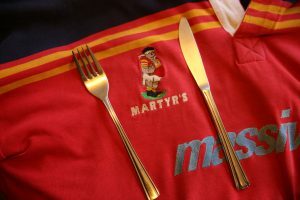 Martyrs Supporters Lunch – Chobham 1st XV v Twickenham 16th January 2016. The Martyrs Supporters Lunch hosted by David Fidge is being held on Saturday 16th January 2016. The rugby will be a local derby when the 1st XV play Twickenham. Unfortunately we only have one home fixture, but on the positive side will mean that we can give our full support to the 1st team. Bar Open 11.00 am Sit down 12.15pm Kick Off 2.00pm. It has been decreed that this lunch is a compulsory event for ALL those Martyrs who will be travelling to Paignton. ‘’Willie Austen” will be entertaining you with a wide range music. Please can you let David Fidgehere or 07801 759 518, know if you would like to attend before Wednesday 13th January 2016, by clicking on this page indicating that you are going or by emailing me, Geraint, here .